Itama, the Italian open yacht par excellence, the epitome of power and style, is writing an important new page in its fascinating history that will captivate its fans. Following in the wake of the Ferretti Group’s innovative energy at the Cannes 2016 boat show, Itama has unveiled a new version of a timeless classic. 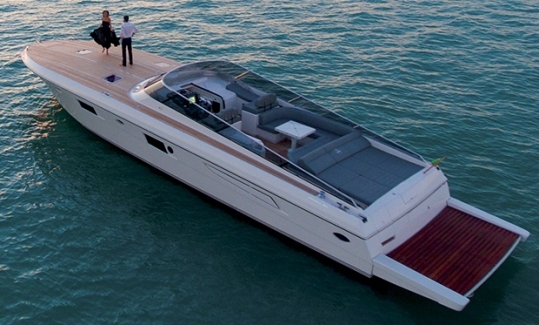 The Itama 62 was shown at the Cannes boat show with a hull in white color and a deck made entirely from teak. With this unprecedented solution, Ferretti Group is showing future Itama yacht owners how they can customize both the interior decor and personalize their own open yacht by choosing the color of the hull and the layout of the fore deck to best reflect their needs and taste. The Itama style remains unique and inimitable: these exquisite yachts designed by Marco Casali by the sea, renowned around the world for their simple Italian design, unmistakable Mediterranean spirit, sleek and sporty lines, and incredible rough seas handling thanks to a pure deep Vee hull.